In today's world, everyone is seeking to understand loss and find hope. Spinning Gold out of Straw is a candid, honest look at the journey back to wholeness following the loss of a child. 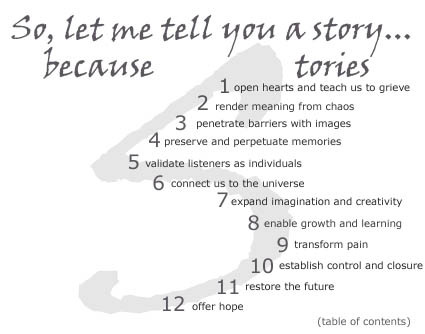 As a master storyteller, Diane Rooks found healing in the stories she heard and told. Pulling from extensive interviews and research, combined with her own rich insights, she reveals how stories repair even the most shattered lives. Filled with stories from folklore and personal experience, this book clearly illustrates how to find a life of growth and meaning on the other side of significant loss. 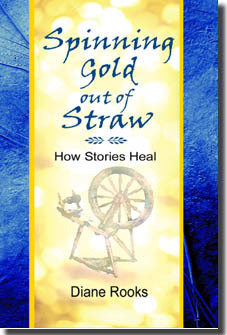 You can now hear the author tell some of these gentle, healing stories in the newly recorded CD or audiocassette "Selected Stories from Spinning Gold out of Straw." See what others are saying about the book in Endorsements and Reviews, read an Excerpt from the book itself, or Order your copy of the book, CD or audiocassette today.